BELOIT — West Branch played tough defense but stumbled against Canton South in a 38-36 loss on Monday in an Eastern Buckeye Conference encounter. The Warriors (13-6, 7-3) were swept by the Wildcats this season and now are one game behind Salem and Minerva in the league standings. Canton South is 15-4 and 6-3. Carly Scarpitti and Peyton Alazaus had nine points each for the Warriors. West Branch won the jayvee game, 31-23. The Warriors are at Alliance on Wednesday. CANTON SOUTH SCORING: Mitchell 2-3-7, Dalton 5-0-10, Smith 2-1-6, Denmark 0-1-1, Brown 1-5-8, Talkinton 2-2-6. TEAM TOTALS: 12, 12-18: 38. W. BRANCH SCORING: Carly Scarpitti 3-3-9, Grace Heath 2-0-4, Sammie Tuel 2-0-4, Maddie Showalter 1-0-2, Peyton Alazaus 4-1-9, Jessica Bock 4-0-8. TEAM TOTALS: 16, 4-7: 36. Three-point goals: Canton South 2 (Brown, Smith). COLUMBIANA — Sebring opened up a 29-13 halftime lead on the way to a 56-43 win over Heartland Christian on Monday. Kyleisha Jays scored 17 points and Emma Whaley 16 for the Trojans. Sydney Ogen led Heartland with 24 points. Madi Mathews added nine. Sebring returns to action Friday at Mineral Ridge in a girl-boy doubleheader for the Coaches vs. Cancer games. SEBRING SCORING: Kyleisha Jays 5-2-17, Bella Meir 3-0-8, Emma Whaley 6-3-16, Aebi D’Ostroph 0-3-3, Delaney Reggi 2-0-4, Bryanne Luca 1-0-2, Devyn Reggi 3-0-6. TEAM TOTALS: 20, 8-12: 56. HEARTLAND SCORING: Madi Mathews 2-5-9, Sydney Ogden 9-4-24, Julia Reynolds 1-0-2, Jordan Webb 1-0-3, Sarah Adkins 1-0-2, Brooklin McCoy 1-1-3. TEAM TOTALS: 15, 10-19: 43. Three-point goals: Sebring 8 ( Jays 5, Meir 2, Whaley), Heartland 3 (Ogden 2, Webb). GIRARD — South Range outscored Girard in every quarter for a 56-39 win Monday. Izzy Lamparty led the Raiders with 16 points and Bree Kohler added 10, including a buzzer beater at the end of the first half. A Marlaina Slabach three-pointer gave the Raiders a 31-18 in the third quarter. South Range improves to 11-7 overall. In the junior varsity game, Girard rallied from a 24-19 deficit in the fourth quarter for a 32-28 win. South Range will host Youngstown Mooney on Wednesday. MINERVA — Coletta Miller scored 17 points and Addie Rhodes collected 15 points and nine rebounds in leading Minerva to a 52-36 win over Sandy Valley on Monday. The Lions — who led 31-14 at halftime — improve to 14-3 on the season. Minerva won the two-quarter junior varsity game, 20-18. The Lions will play at Louisville on Wednesday. 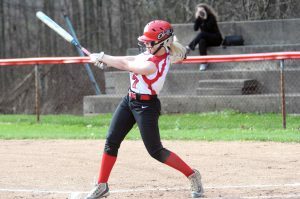 SANDY VALLEY: Offenberger 2, 7-9, 11; Neary 0, 0-2, 0; Pahanish 0, 1-4, 1; Altimore 3, 5-8, 12; Sickafoose 1, 4-6, 7; Crone 1, 0-0, 2; Parker 1, 0-0, 2. TEAM TOTALS: 8, 17-29: 35. MINERVA SCORING: Nelle Yankovich 2, 0-0, 5; Elyssa Imler 1, 0-0, 2; Hannah Wayts 3, 0-0, 9; Coletta Miller 4, 9-9, 17; Addie Rhodes 7, 1-2, 15; Shelby Wheeler 1, 0-0, 2; Gina Slentz 1, 0-0, 2; TOTALS: 19, 10-11, 52. Three-point goals: Minerva 4 (Wayts 3, Yankovich), Sandy Valley 2 (Altimore, Sickafoose). HANOVERTON — United didn’t reach double digits in any quarter as Jackson-Milton posted a 43-26 win Monday. Courtney Mercer and Ashley Cameron each scored 11 points for the Bluejays, who opened up a 25-12 halftime lead. Celeste Hofmeister topped United with 13 points. United is 9-10 on the season. The Eagles will host state-ranked Western Reserve at 7 p.m. Thursday for a varsity-only contest. United is not expected to field a junior varsity team the rest of the season. JACKSON-MILTON SCORING: Kylie Wilson 1-0-3, Chelsea Williams 0-5-5, Camryn Mitchell 0-1-1, Megan Fultz 0-1-1, Courtney Mercer 4-1-11, Ashley Cameron 4-3-11, Kenley Taylor 0-1-1. TEAM TOTALS: 14, 12-21: 43. UNITED SCORING: Loren Swords 1-1-3, Harley Salmen 0-0-0, Madison Boyle 1-0-2, Colby Burton 0-0-0, Kyleigh Daggy 1-0-2, Celeste Powers 2-1-6, Kendyl Dggy 0-0-0, Destiny Hill 0-0-0, Savannah Burton 0-0-0, Celeste Hofmeister 6-0-13, Megan Drake 0-0-0. TEAM TOTALS: 11, 2-10: 26. Three-point goals: Jackson-Milton 3 (Mercer 2, Wilson), United 2 (Powers, Hofmeister). 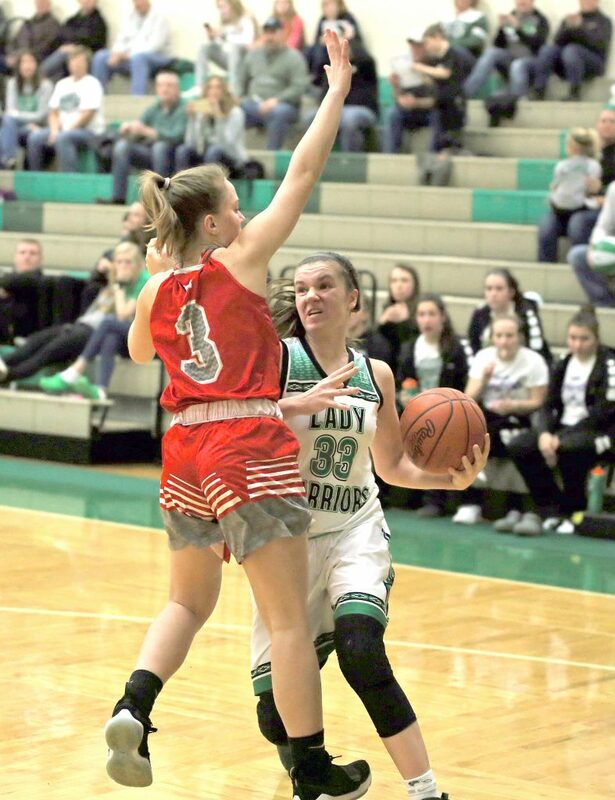 LISBON — Izzy Perez dropped 27 points with nine steals and four assists as Lisbon ran wild on Lowellville 83-26 on Monday. Maddie Liberati had 20 points and six rebounds. Chloe Smith and Callie Steed added 12 points each. Lisbon is 14-5 and hosts Wellsville on Wednesday. Lisbon won the two-quarter jayvee game, 20-12. Madison Haifley had eight points for the Blue Devils. LOWELLVILLE SCORING: Marah Bellis 1-1-3, Sam Moore 3-3-9, Maliyah Hedrich 0-1-1, Julianna Lellio 1-0-2, Chisti Donatelli 2-1-5, Ryane Eseaurin 1-0-3, Kayla Rougs 1-1-3. TEAM TOTALS: 9, 7-14: 26. LISBON SCORING: Izzy Perez 12-2-27, Cadee Johnson 1-0-2, Chloe Smith 3-6-12, Callie Steed 4-3-12, Maddie Liberati 10-0-20, Corinne Freeman 0-2-2, Madison Haifly 1-0-3, Parker Henthorne 2-0-4, Justyce Vrable 0-1-1. TEAM TOTALS: 33, 14-21: 83. Three-point goals: Lisbon 3 (Perez, Steed, Haifly), Lowellville 1 (Eseaurein). NORTH RIDGEVILLE — Kayla Muslovski dropped 25 points while Kennedy Fullum added 24 more as Columbiana rose to beat Lake Ridge Academy 71-46 on Monday. Fullum also had nine rebounds, four assists and three steals for the Clippers, 16-3. Mady Rosado had 15 points for Lake Ridge Academy. Columbiana hosts Mineral Ridge on Thursday. COLUMBIANA SCORING: Tori Long 1-1-3, Karissa Tringhese 0-0-0, Kayla Muslovski 10-1-25, Tessa Liggett 4-1-9, Grace Hammond 1-4-7, Grace Witmer 1-0-3, Kennedy Fullum 12-0-24, Tomi Ross 0-0-0, Madison Moser 0-0-0, Morgan Dunlap 0-0-0, Sierra Macklin 0-0-0. TEAM TOTALS: 29, 7-10: 71. LAKE RIDGE ACADEMY SCORING: Mady Rosado 9-0-15, Kayleen Kaatz 4-2-10, Marta Rashkowski 0-0-0, Emma Miller 1-2-4, Maria Munoz 0-0-0, Taylor Traut 5-0-11, Grace Adams 2-0-6. TEAM TOTALS: 18, 4-5: 46. Three-point goals: Columbiana 6 (Muslovski 4, Hammond, Witmer), Lake Ridge 6 (Rosado 3, Adams 2, Traut). NEW MIDDLETOWN — Haley Eskra had 14 points and Krista Perry added 13 points, eight rebounds and three blocks as Crestview clawed past Springfield, 49-40, Monday. Tanner Hoffer totaled eight points, 16 rebounds and four steals for the Rebels, who are 12-5. The Rebels led 27-14 at halftime, but the Tigers closed within five points in the fourth quarter before Shianna Mathes hit a three-pointer to put the game away. Makenzy Capouellez had 21 points for the Tigers (9-9). Crestview also won the two-quarter junior varsity game, 28-16. Ashton Hughes scored 11 points for the Rebles. Kayla LaMorticella had 10 for the Tigers. Crestview will host Brookfield today in girls-boys doubleheader. Springfield hosts East Palestine on Thursday. CRESTVIEW SCORING: Mara Halas 0-0-0, Haley Eskra 5-0-14, Payton Huff 3-0-6, Shianna Mathes 2-0-6, Tanner Hoffer 3-2-8, Addison Bandy 1-0-2, Krista Perry 4-5-13, Stephanie Dickey 0-0-0. TEAM TOTALS: 18, 7-10: 49. SPRINGFIELD SCORING: Marlie Applegarth 0-1-1, Makenzy Capoullez 8-2-21, Ellie Centofanti 0-0-0, Kylee Kosek 4-0-8, Mariah Johnson 3-4-10. TEAM TOTALS: 15, 7-11: 40. Three-point goals: Crestview 6 (Eskra 4, Mathes 2), Springfield 3 (Capoullez).